Have you heard of Bouncy Bands? When I first did I was so excited to add them to my flexible seating classroom and couldn't wait to try out two of them and write a review. I have extremely active students this year. We move a lot anyway using brain breaks like GoNoodle but that is not enough. Sometimes they do need to sit down and get some things done with paper and pencil but still need to move. That's why I thought Bouncy Bands might be great. If you like video reviews, be sure to keep reading until you see my video review below! Brain research has shown that movement helps the brain process learning better and as teachers, we all know if students get plenty of opportunities to move, they will be able to concentrate better and maintain focus longer as well as feel better about school. (We don't need research to tell us that!) Hence the well-deserved explosion in the last year of brain breaks, movement breaks and the push in many places to add back recesses and PE classes that have been cut over the years. As teachers we do what we can in our own classroom and during our time with the students and simple things we can build into the structure of our classroom are often the best. That's why something like a Bouncy Band is such a big deal in a small package! Check out what they look like when they are attached to a desk and a chair! So I tried one chair Bouncy Band and one desk Bouncy Band. They were very easy to set up and took less than 10 minutes to attach both. The bands are very strong but flexible which I love. They are not going to break or tear for a long time, unlike my exercise band I have at home for myself. Here is one of my little cherubs trying out the chair version. Now to be honest, I didn't think this child was very active, but when given the opportunity to move with a Bouncy Band, she took advantage and used it for some wiggles and sensory input. If you prefer video reviews, check out my brief, one minute, video review here with some more footage! Now, the bouncy band on the desk has stayed on without a hitch. The chair bouncy band I was trying out did come off twice. Students fiddle with everything in my classroom and I think that might be why, but they are so easy to put on the chairs it took me maybe 60 seconds to put it back on the first time (I waited until the kids were at lunch) and the second time the band only came off one leg of the chair and it took me maybe 10 seconds to fix it. Easy peasy! And I love that it gives really good resistance and is made of a firm material. It will not tear or break for a long time, which is important in a classroom with very busy feet! So to find out even more details, head over to the Bouncy Bands website here. Also, many educators use websites and funding sources like Donor's Choose, GofundMe and Adopt-a-Classroom to get them for their classrooms so I have included some links below for you. These links either include suggestions on how to get your projects funded or send you to the website to get started. Here are some tips and suggestions on how to get funded by these amazing organizations. Want to see more? Here is a short introductory video to see how Bouncy Bands work. And finally, check out these national survey results for how Bouncy Bands impact students. 92% of teachers reported that students enjoy using them. 92% of student said they help them "relax" so they can learn better. 84% of students say Bouncy Bands make it easier to do their work. See the full survey results here. So do you use Bouncy Bands in your room? Would you consider it? Let us know! This blog has a disclosure statement. Read it here if you are interested. Great question! I have not heard any noise at all with them! 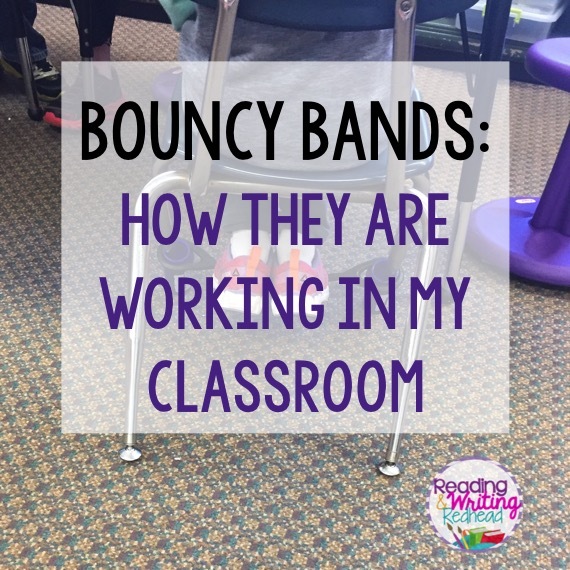 Did you set any ground rules for using the Bouncy Bands in your classroom? I didn't set any. I just demonstrated them and explained a little. They are silent and are not a management issue at all!